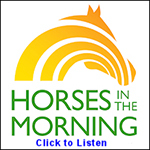 DIY “cool” entertainment for your horses this summer. Faith typically uses a hose a spray her horses down, but for the sake of efficiency she tried to come up with an alternative. The best 8$ I could have spent on these horses ! 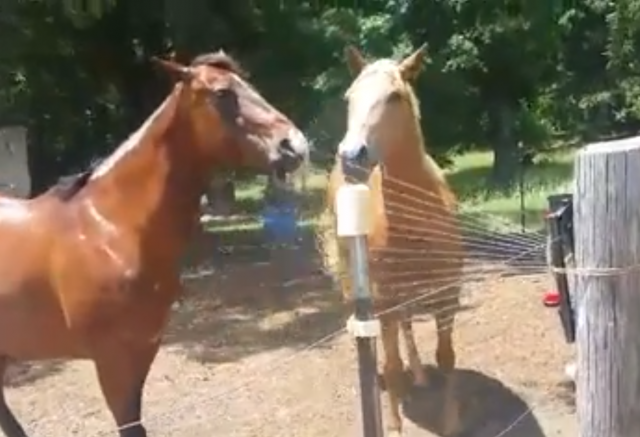 As soon as the sprinkler had been installed and switched on, Faith’s 9-year-old Palomino mare Khaleesi “was in it.” Khaleesi’s pasture mate Nomi likes the new shower system too, but Khaleesi isn’t keen to share, which makes sense, given her name. Lucky for us, the introduction to the sprinkler was so funny that Faith didn’t get much done in the barn. She was grabbing for her camera instead. We love her giggles in the background as she watches Khaleesi and Nomi play. If you’re thinking about Faith’s water bill and waterlogged pasture, so has she. The sprinkler is only on for short intervals. Khaleesi just can’t get enough of the sprinkler! Faith says it’s the best $8 she’s ever spent on her horses. Have any barn DIY projects of your own? 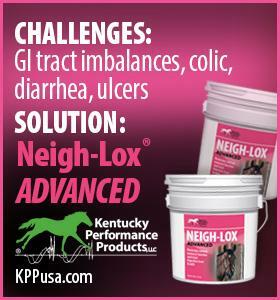 Share them on our forums, Equestrians Anonymous!